A traditional hospital donor wall that lists the names of its many significant contributors on engraved plaques serves the very important purpose of recognizing those valuable contributors. To be sure, public recognition is an important and necessary component of any good stewardship strategy. But have you ever wondered how often people actually read the names of those important donors? Beyond the fact that an interactive video donor wall is visually more engaging than a static wall adorned by a list of names, there are countless ways that your wall can grab the attention of passersby, tell your story and form a deeper connection with the community you serve. Here are a few tips that can help create a highly engaging interactive donor wall that can recognize your supporters in a unique and meaningful way and also tell your hospitals’ story and engage others to become supporters. When you thank a donor for making a significant gift, it’s perceived as a nice polite gesture. But if one of the patients whose lives have been transformed thanks in part to their support delivers the thank you, that message will carry deeper emotional significance and greater meaning to the donor and will resonate with anyone else witnessing it. There is nothing more powerful than creating a very real, tangible association between a donor’s financial contribution and a positive outcome. The video thank you messages can come from anyone who has personally felt the impact of the donor’s gift: family members, friends, co-workers, etc. When you give a voice and put a face to the people who have been touched by their generosity, your message will acquire an emotional intensity it could not otherwise have. Recognition on traditional donor walls is usually limited to the very top-tier donors who have made significant financial contributions. Thanks to the interactive nature of your video donor wall, visitors who are interested can delve a little deeper and learn about other donors and supporters who have contributed to your hospital. For example, your donor wall could recognize the contributions of certain volunteers who gave generously of their time, or the individual or group who organized an extraordinary fundraising event on your behalf. It can also highlight donors who have made a more modest financial contribution. Most people who will pass by your donor wall will not have the ability to make a gift as significant as those top-tier donors. They may, however, be sufficiently inspired by the volunteer, the community fundraiser or the average donor to take action and do the same on your behalf. 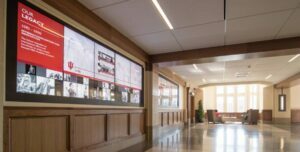 Your video donor wall provides a great opportunity to inform people about the history of your hospital from its inception, through its growth to become the important pillar within the community today. As you walk people through the timeline of significant milestones, include other significant local historical points of reference to reinforce the connection between your facility and the larger surrounding community. We all have a tendency to look backwards and celebrate the milestones from the past. This may be true in the telling of your own hospital’s story: the date you got the MRI machine, built a new wing or expanded a ward. But this is also an opportunity to make your case for support. You can and should be speaking of future plans and projects that your hospital will need to implement to better serve the community but will require the generous support from donors to become a reality. It’s also a great way to connect people with your mission and vision in a very practical way.